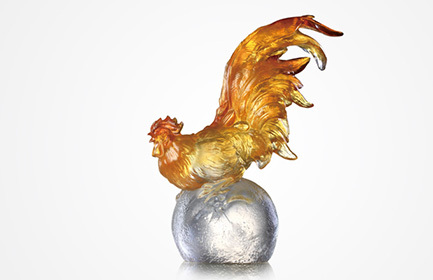 Twelve years ago, LIULI was invited by The Sanxingdui Museum in Sichuan, China to explore the 3,000 year history of lost-wax casting for the resurrection of the national treasure The Bronze Rooster. 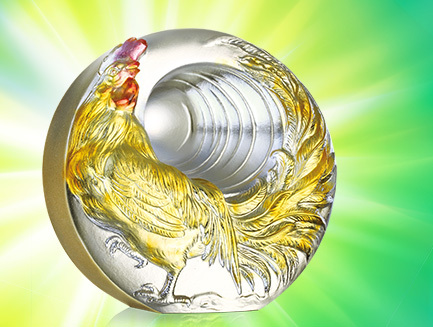 In 2017, Year of the Fire rooster, LIULI awakens the image of the mighty rooster through Awaken, the First Ray of Sunlight, a collection of heavenly liuli birds inspired by the past and designed for modern times. Let it cast the first ray of light upon 2017 for an entire year of illumination. The concept of light is at the forefront of Loretta H. Yang’s collection. Legend has it that when the sun rises from the sacred tree, the golden bird becomes the sun. In ancient times, the sun symbolized the rooster and the rooster became the messenger of light. Coincidentally, liuli is a medium that allows the most light to pass through. Because of its transparent qualities, its inner space becomes a literal and figurative harbor for light. This collection manifests the abstract concept of the rooster as messenger. With a single crow from the fowl, the world is illuminated. In order to accentuate the rooster’s upright stance, Creative Director Loretta H. Yang urged the artisans to dig deep inside and get in touch with a value they could believe in, a value that can only be seen with heart. 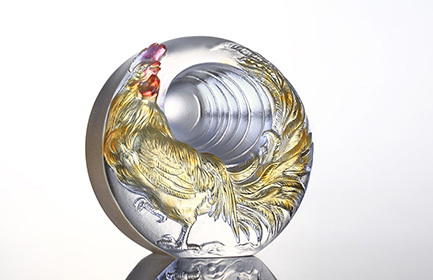 Every piece in LIULI’s Year of the Rooster collection represents a core value: It is the intrepid warrior, it is the beauty of Confucius’ Five Virtues, it is preparedness, it is prosperity and luck, it is the state of being free. The layered colors of collection highlights including Sun Bird, Divine Sound, Dance of the Spring Wind and Welcome the Sunrise were formed using liuli frit to indicate the changes in light before, during and after sunrise and the crown was colored through a fixed placement technique. The design symbolizes the welcoming of the new year’s first rays. We offer it to those who strive to be better, who strive for progress. From the crown downward, the colors in Welcome the Sunrise shift and transform from red to orange to yellow to green to the final display of gold. The proud and uplifted form of the rooster represents the resplendence of the sunrise and is an ode to the confident beauty of this generation. The luxurious feathers of the long-tailed rooster in First Ray of Sunlight fan out under the wutong parasol tree. Fading to transparent from top to tail, it is the very image of elegance. The wutong is by nature refined, a choice perch for all birds. This design makes the ideal gift for a close friend. When designing Divine Sound, Yang chose to present the masculine brawn of the rooster through a design veering on the abstract. Dignified and commanding, it carries itself like an undefeated warrior standing on top of the world. In a shade of vivacious green, one crow from this rooster will revive all living creatures and generate a year of success and fortune. It take a mere eight minutes for the light from the sun to travel 15,210 km to Earth. Within this wide unpredictable expanse of time and space, who would have guessed that it would be the rooster that would be the harbinger of such a powerful illuminating force! In 2017, LIULI resurrects an ancient totem of light with Sun Bird. LIULI’s sculpture appears lifelike with luxurious feathers to symbolize the dawn of the primordial world. Its uplifted tail feathers and encompassing stance recalls the phoenix, the finest of all birds. This design is in praise and honor of those who are extraordinary. Wisdom, strength, courage, benevolence and loyalty are the five virtues extolled by the ancient literati. Study the rooster’s virtues to enable the perpetuation of a natural and unrestrained attitude. Bide one’s time in silent contemplation, await the right moment and victory will be yours. In this design, LIULI utilizes layers of green and amber to convey flowing vitality. 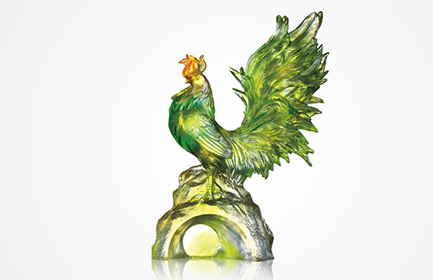 A sculpture with personality, it puts the rooster’s multi-faceted character on full display. We can not predict what 2017 will bring but we do know that each person is a harbor for light. The first of spring, a call across the land, awaken the ancient force of light and luck. Bring the messengers of light from LIULI’s Year of the Rooster Chinese zodiac collection into the fold. Illuminated, may your spirit be uplifted, may grand prosperity and fortune await.